Another layer of security that senangPay has is 3D secure. This security feature applies to all online credit / debit card transactions that happened using senangPay Payment Form. 3-D Secure is an XML-based protocol designed to be an additional security layer for online credit and debit card transactions. It was originally developed by Arcot Systems, Inc and first deployed by Visa with the intention of improving the security of Internet payments and is offered to customers under the name Verified by Visa. Services based on the protocol have also been adopted by MasterCard as MasterCard SecureCode, and by JCB International as J/Secure. American Express added 3-D Secure on November 8, 2010, as American Express SafeKey, in selected markets and continues to launch additional markets. Analysis of the protocol by academia has shown to have many security issues that affect the consumers, including greater surface area for phishing and a shift of liability in the case of fraudulent payments. 3-D Secure adds an authentication step for online payments (Wikipedia). The 3D Secure feature will be prompt during the online transaction process by credit / debit card. This is after customer fill in all the required information to make purchase. 1. Upon clicking the Submit button, customer will be directed to a 3D secure website for authentication. This is an external secure site by the customer’s bank. 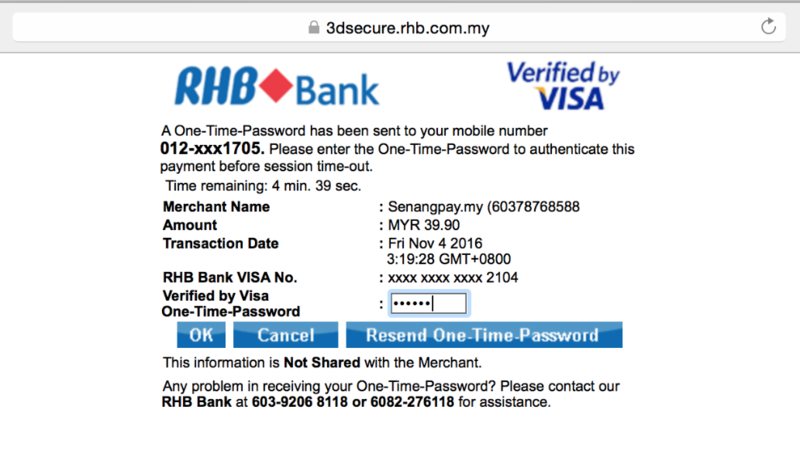 In this example, the customer is using RHB Credit Card. 2. Customer then need to key in the OTP password that is sent to his / her mobile phone. Fail to do so will result the purchase FAILED. What kind of fraud that 3D Secure protects from? 1. Only cardholder can make payment through the senangPay Payment Form. 2. 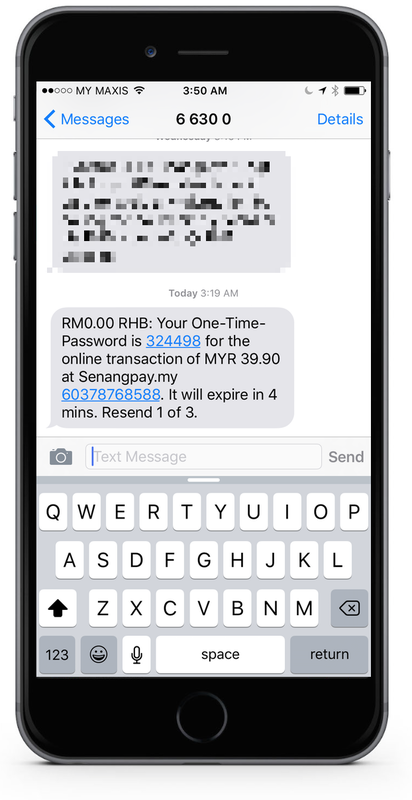 Nobody else can make the payment through senangPay Payment Form unless he steals the credit card and the cardholder’s mobile phone, with assumption that he / she has an access to the mobile phone to get the OTP password. 3. Anonymous cannot abuse the senangPay Payment Form. What is the benefit of 3D secure to merchant? 1. The risk of fraud is shifted to the Bank. 2. Bank protects cardholder / customer from being fraud, thus this leads to a free of mind in using credit / debit card, and thus, this leads to a potential market of buyers to use credit card to buy a merchant’s / your products. 1. senangPay is safe & secure. 2. senangPay integrate with 3D secure features with local banks. Have more questions? Submit a request by clicking the green help button right side, bottom.